Baking frozen wings is the easiest way to make chicken wings, and in my opinion, it’s also the tastiest! Most people will tell you not make baked wings from frozen, but if you do it the right way, these baked wings steal the show. Frozen chicken wings are so easy to make: no thawing, no par-boiling, no pre-seasoning. Just throw them on a sheet pan and bake them according to my method! Exactly what busy parents need – a perfect chicken wings dinner with the least amount of fuss. This easy chicken wings recipe also includes the best chicken wing sauce recipe ever. I’ve never seen anyone else make wing sauce this way, and boy, is it tasty! 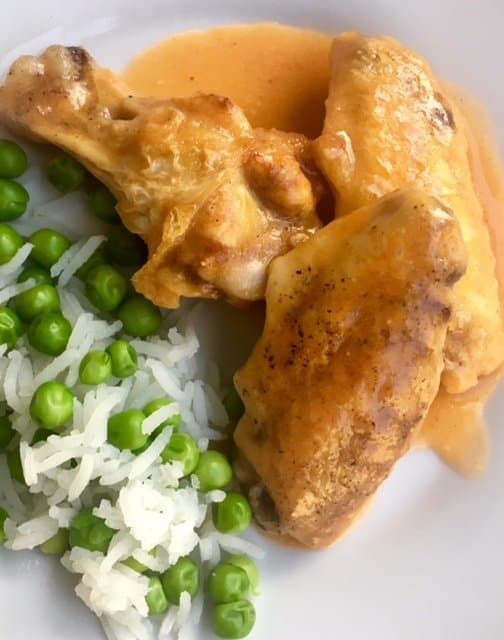 We’ve gone through a lot of trial and error over the years to perfect this wing sauce (my husband’s creation), which includes chicken broth as the secret ingredient. When I married into my husband’s family, I was introduced to some beautiful flavors I had never before experienced. Indian cuisine, sushi, and…. gasp!… baked hot wings! How is it possible I was so sheltered that I had never tasted hot chicken wings before??? Honestly, I don’t know how I survived without them. If I had to live on only one meal for the rest of my life, this would probably be it. Or Mexican food. It’s a toss up. But probably baked hot wings. My mother-in-law, to this day, makes the best chicken wings ever. These come close, but still fall a bit short of hers. But what really takes this spicy chicken wings recipe over the top is the chicken wing sauce they are drenched in. My husband and I have perfected this wing sauce recipe, and I must say, I’m pretty proud of it. 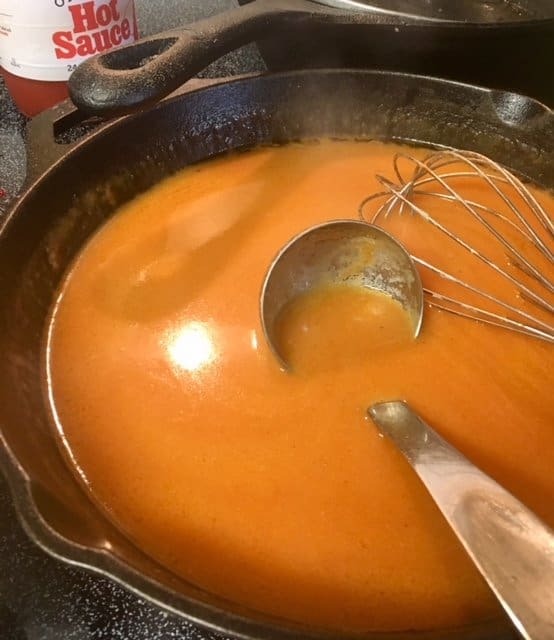 Buffalo wing sauce is my absolute favorite part of any chicken wings meal, and I am known to douse my entire plate with the stuff. It’s so spicy, savory, tangy, with just a hint of garlic and vinegar – how can I help but love it?? But sometimes, I eat a little too much of it and end up in sweat city. What makes this homemade wing sauce special is the fact that it starts with a chicken gravy. Starting with a butter and flour (or cornstarch) rue, chicken broth is added, and finally seasoning and wing sauce. 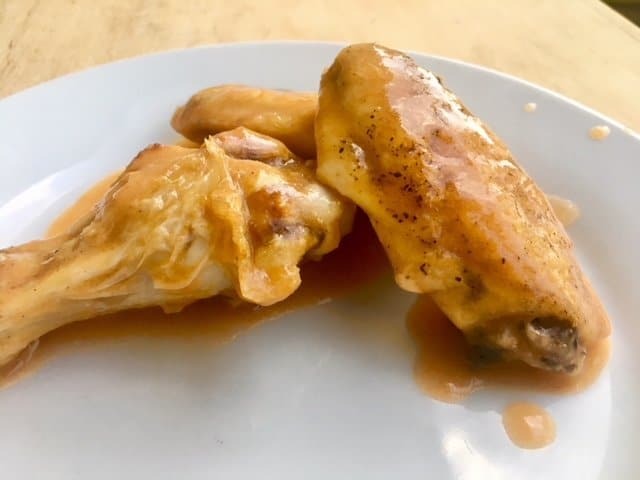 Since it has the consistency of gravy, it really sticks to your chicken wings like no other sauce can. And since it’s not too hot, you can eat more of it. That’s what I’m talking about! I’m calling it buffalo chicken gravy. 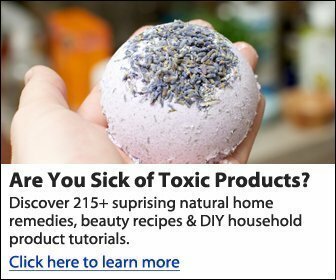 Also, I make a lot of it. Because, you don’t want to eat the side dish of rice and buttered peas without this gravy on top. Trust me. Ok, back to the wings. Baking frozen chicken wings is so much easier than thawing or even using fresh wings. You literally throw them in the oven and forget them until it’s time to make the sauce. Not only is this the best chicken wings recipe ever, it’s also the easiest! A+ in my book. Side note: what’s with the obsession for fried chicken wings in this country? In my opinion, baked wings are far superior. They are much more tender, and I find the fried wings a bit tough and chewy for my taste. Maybe I just haven’t had any really good ones yet. In any case, baked wings are easier to make and to eat. 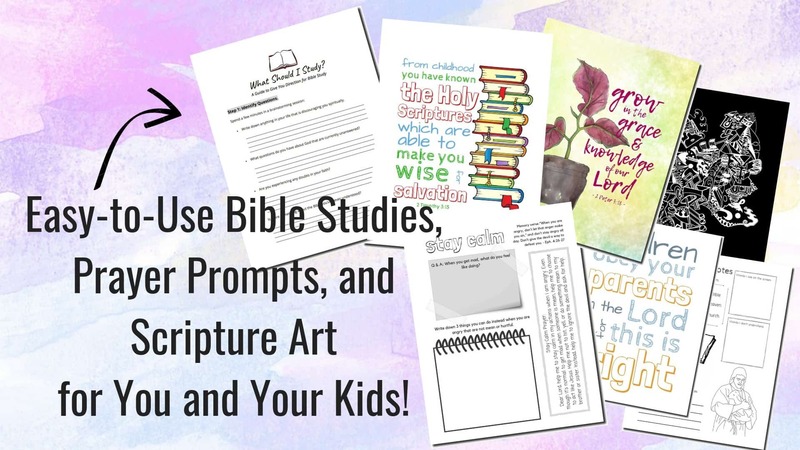 *The following links are affiliate links, which means I earn a commission if you purchase an item. Thanks for being a part of N + N! 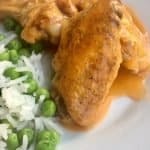 Frozen Chicken Wings – I like buying these as opposed to fresh because it’s so simple to keep them for long periods and just pull them out of the freezer as needed. They are usually called “frozen chicken wing sections” in the grocery freezer meats section. Also, frozen wings are economical and you don’t have to touch raw meat in this entire process. Just rip the bag open and dump on a sheet pan! No babying necessary. Sometimes I use the smaller 2.5 pound bag, and sometimes I make a double batch of sauce and cook a large 4 pound bag. Cooking oil – You can use any oil to drizzle on top of your wings for baking. 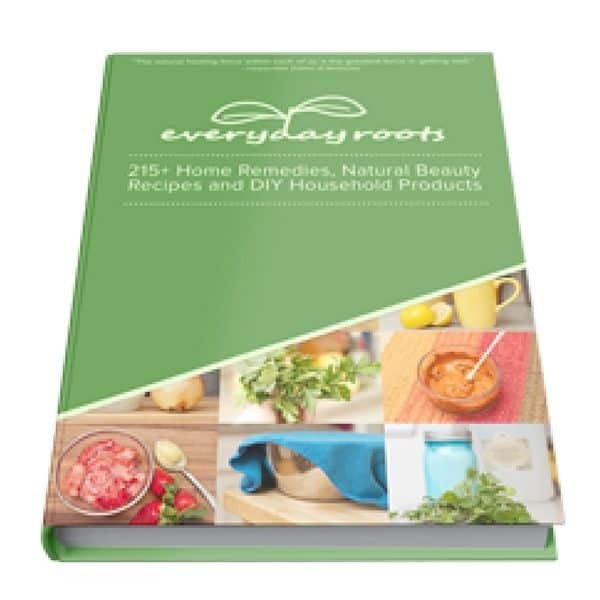 I like using light olive oil, but you could use grapeseed oil, avocado oil, canola oil, etc. 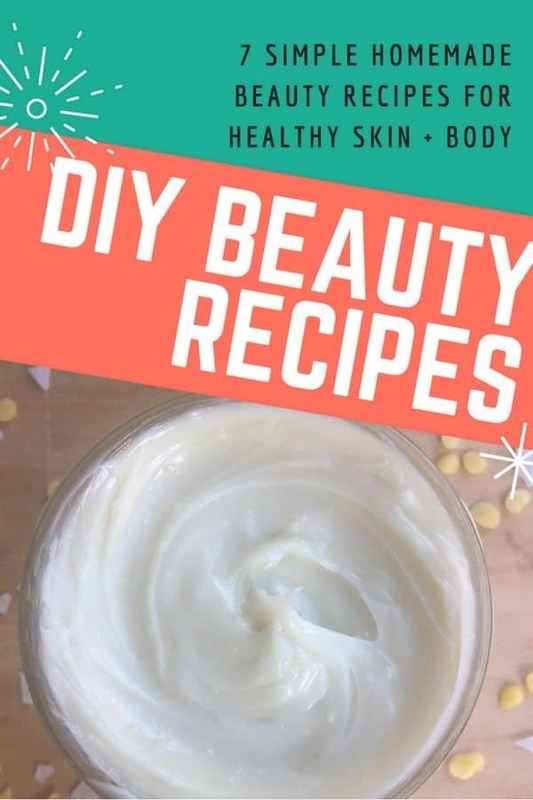 Flour or cornstarch – Sometimes I use this non-GMO whole grain white wheat flour, and sometimes I use organic cornstarch for the gravy. Buffalo or hot sauce – our favorite is Texas Pete, but there are so many great varieties out there. Use whatever you have on hand. Psst… the recipe card is at the bottom of the post for your convenience. First, dump your frozen wings onto a large shallow baking sheet pan (like this). Using a large shallow sheet pan is important for this baking method. Drizzle with oil and season with salt and pepper. I like making sure the wings are skin-side-up for the best crispy result, but this is optional. 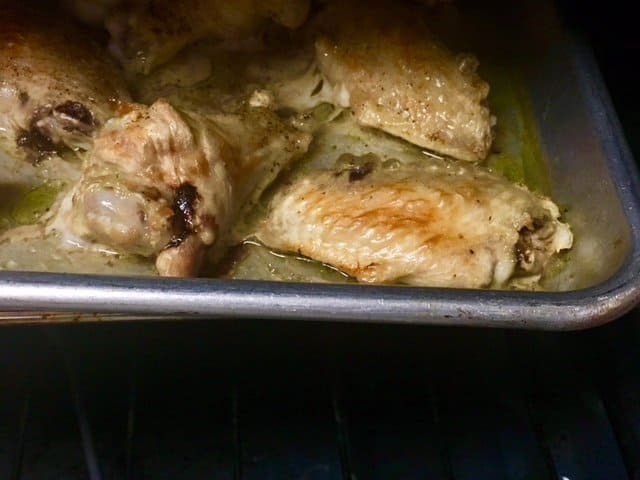 For even better results, bake the wings on a baking rack so the juices drip to the bottom of the pan. I don’t do this, but it would definitely result in a crispier wing. Cover with foil and bake from frozen at 400°F for 50-60 minutes. Keeping the wings covered ensures the wings stay tender. Once the wings are cooked through, remove the foil and broil on high for 15 minutes or so until the skin is crispy and golden. Broiling is the key to crispy baked chicken wings without frying. While the wings are broiling, you have just enough time to make the gravy and boil some rice and peas, or whatever side dish you’re having. 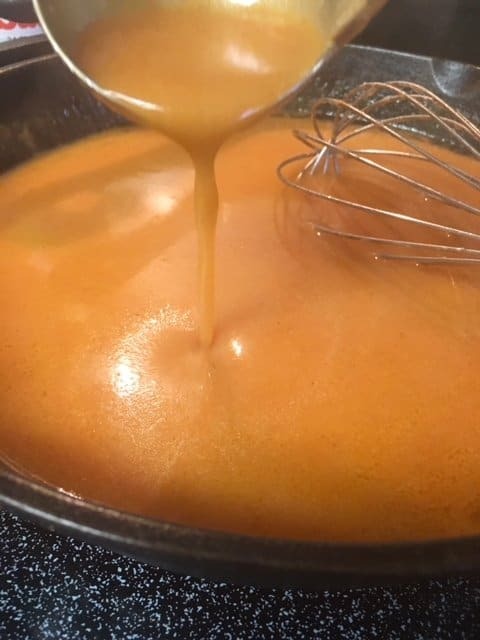 As soon as you turn your wings on broil, start making the buffalo chicken gravy. It is so easy! Melt butter in a saucepan (I use a cast-iron skillet). Add flour or cornstarch and whisk together to make a rue. Add chicken broth and simmer until thickened. Last, whisk in your buffalo sauce. I usually just eyeball it and then test it to see if it’s spicy enough. You can always add more hot sauce. Season with salt and pepper if desired. The hot sauce usually makes it salty enough, though. This recipe is perfect served with fluffy rice and buttered peas. They are just begging for this sauce! We love using basmati rice and frozen green peas, which stay bright green after cooking. 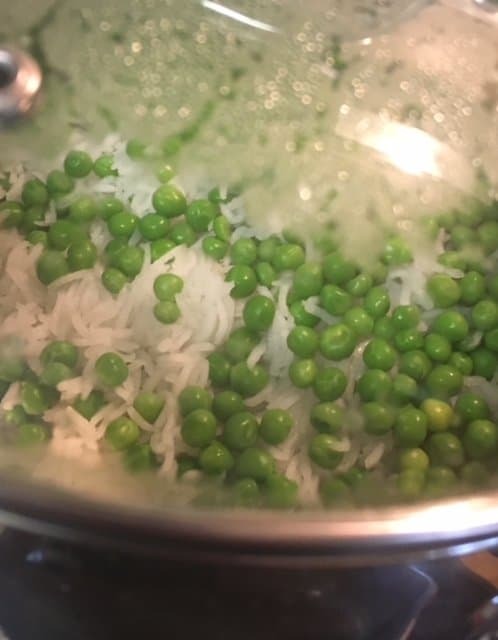 I usually add one cup of basmati rice and one package of frozen green peas to a large pot and boil them together, then add butter and salt if desired. Or, try my perfect pan-fried potatoes on the side! If you like, you can pour the liquid off while you are baking frozen wings, before broiling them. Use this liquid for the chicken broth in the buffalo gravy recipe. You’ll save money on boxed broth, and waste less! You can make a double batch and eat the baked wings as leftovers for lunches, etc. Keep in mind that they won’t be as crispy, but they’ll still taste great! To reheat, make sure you heat low and slow. If you heat them on a super high high (like full power in the microwave) they will get tough instead of tender. If you want both sides of your wings crispy, flip the wings halfway through the broil time (you may have to broil a little longer as well). I’m usually not patient enough for this, but if you want to, go for it! For easier cleanup, line your baking sheet with aluminum foil before baking. If you do this, you’ll want to use a baking rack so the wings don’t get stuck to the foil. Baking frozen wings is so simple, and this method is minimum effort which produces maximum flavor! 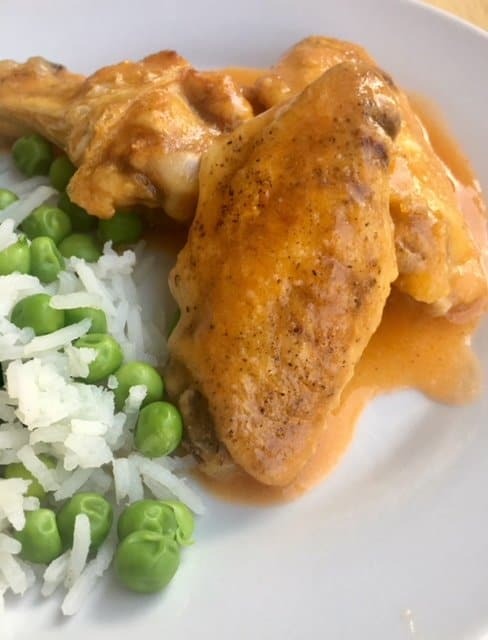 These easy baked wings are smothered in a buffalo chicken gravy that you'll be craving from now until forever. 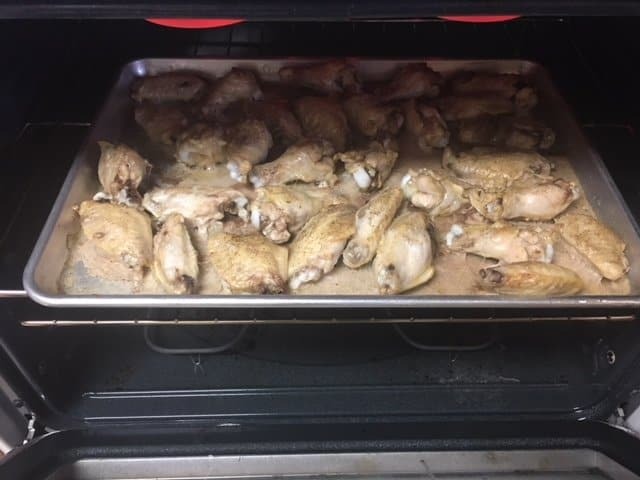 Preheat oven to 400 F. Place frozen wings on a large shallow baking sheet pan and drizzle with oil, salt, and pepper. Cover with foil and bake wings for 50-60 minutes. Remove foil and switch oven to BROIL. Broil on high for 15 minutes or until golden brown and crispy. While wings are under the broiler, make the sauce. Melt butter in a saucepan and add flour / cornstarch to make a rue. Add chicken broth and whisk until smooth, simmering until thick. Add 1/2 to 1 cup buffalo sauce to taste. 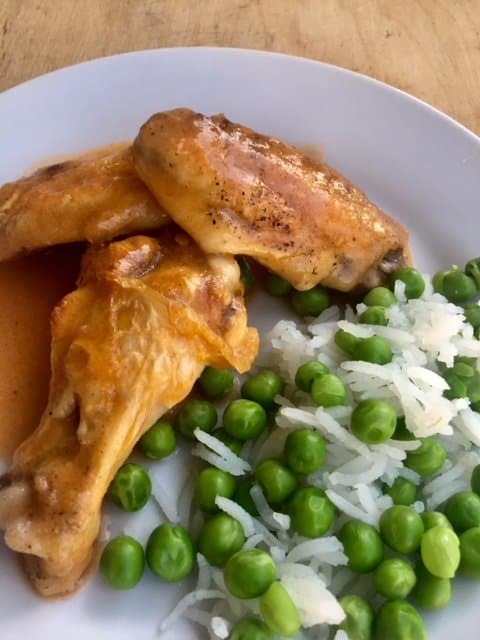 Pour over wings and serve with fluffy rice and buttered green peas. I hope you’ll try baking frozen wings this week! Which do you like best: baked or fried wings?